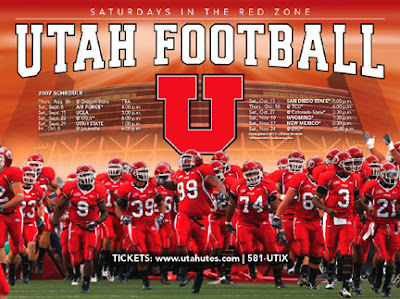 Utah is selling Saturdays in the Red Zone, but the Utes will be busy on Thursdays and Fridays, too. Utah opens next Thursday at Oregon State and plays at Louisville on Oct. 5, a Friday, and at Texas Christian on Oct. 18, a Thursday. The Utes play host to UCLA on Sept. 15. Yes, that's a Saturday. Poster schedules: Florida State, Wyoming, Vanderbilt, Pittsburgh, Arkansas, Kent State, Navy, Duke, Purdue, Missouri, South Carolina, Wake Forest, Middle Tennessee, Brigham Young, Syracuse, Louisiana Tech, South Florida, Colorado, Southern Mississippi, Washington State, Kentucky, Houston, Toledo, Iowa State, North Texas, Arizona State, Cincinnati, Minnesota, Clemson, North Carolina State, West Virginia, East Carolina, Nevada, Georgia Tech, Florida, Oklahoma, UCLA, Kansas State, Stanford, Auburn, Northwestern, Iowa, Texas El Paso, Penn State, Ohio, USC. Sweet poster - that's the best one so far.